Have you been nominating your favorite blogs? Tomorrow, November 30, 2010 is the deadline for nominations for Family Tree Magazine's 40 ~ 2011 Best Genealogy Blogs! Be sure to get your nominations in here! Win a Copy of RootsMagic 4! Amy Coffin from We Tree is going to be giving away a couple of RootsMagic 4 programs! She has received them from attending conferences and has more programs than she needs. You can find out the details on how to enter the give away at her blog post here. Good Luck! 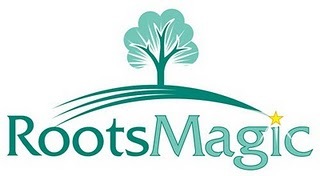 I had an extra RootsMagic 4 program also and thought about using it as a gift through this blog, but then I learned my new found cousin in Sweden did not have a genealogy program, so I mailed it to him. We will both have RootsMagic 4 now and it will be easy to share information. The language barrier would be enough to have to work through, although so far so good as my cousin understands, reads and writes English pretty well! Keep in mind Heritage Happens will be giving away a genealogical "something" (I haven't decided yet what it will be) too after the end of the year and I total the responses on my posts! The one who has made the most comments by the end of the year will win! T- Timelines H - Historical Stories A- Ancestry dot com N- Next of Kin K- Kentucky Records S- Social Networking G - Genealogy Societies I - Immigration Records V- Vital Records I - Interviews N - Naturalization Records G - Google Reader, maps, books…etc! "Thank you" blog followers, you are so wonderful and I am very grateful for you! Wishing you all a very Happy Thanksgiving! Enjoy the "3 F's" ~ "family, friends & food!" I also wish to say HAPPY 4TH BIRTHDAY to my grandson, the prince! 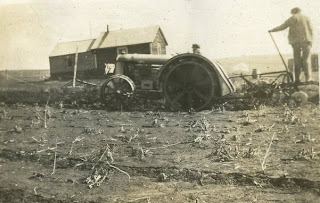 I have chosen to transcribe this letter and an explanation of the picture which is posted below. 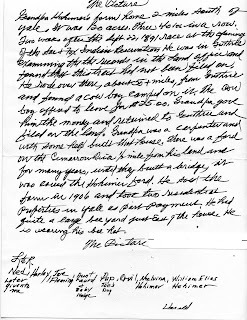 The letter was written by my grandfather's cousin and the Hohimer farm was that of my 2nd great grandfather. 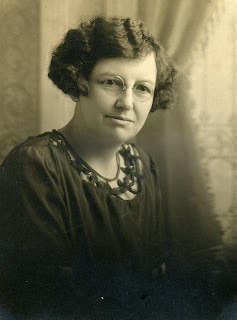 Wordless Wednesday ~ Unknown Woman; Could She Be a Westby? Family Tree Magazine's 40 Best Genealogy Blogs Contest! 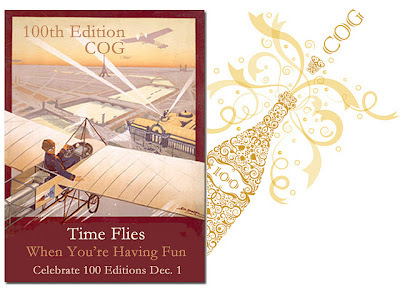 Family Tree Magazine announced its 40 Best Genealogy Blogs contest for 2011! Last year, by some miraculous reason, Heritage Happens was honored to make the top 40 Best Genealogy Blog list! I was stunned, and it was truly amazing! This year we have so many new and awesome blogs out there! 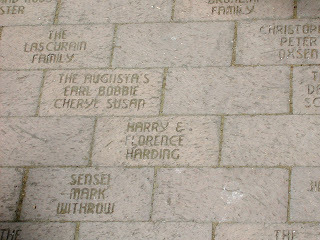 Of course, we still have the "seasoned" blogs available also. This year it becomes so much tougher though because there are now something like 1200 (? ), or more, blogs to choose from! I have my favorites, and I bet you do too. I understand that we will not be able to choose Genealogy Gems, Genea-Musings, DearMYRTLE or GeneaBloggersas a choice for the top 40. Nor will we be able to choose any of Thomas MacEntee's several other blogs, I have lost count how many he authors now, 10? Maybe it is 12? The Trials & Tribulations of My First Quilt & More! The new Genea-Quilters blog which Myrtle and Genea Philbert Ortega have started and contribute to has sparked my own interest again in starting my very first quilt. I am very happy to say that I have actually, finally, started my first quilt! I have wanted to make a Harley Davidson quilt for several years after seeing a few of them made. My husband has often said I would never make one, but he should know by now, you never say never to me! Besides, if I make quilts they may be passed down to my descendants and become heirlooms! Between my husband and I we have many many Harley shirts saved through the years. I kept saying I was going to make a quilt one day! I also have bought and saved Harley scarves from different stores we have visited all over the country. This means I will be making at least one more Harley quilt sometime in the future.